As citizens, why do we care about the everyday life of ministers and civil servants? We care because the decisions of the great and the good affect all our lives, for good or ill.
For all their personal, political, and policy failings and foibles, they make a difference. So, we want to know what ministers and bureaucrats do, why, and how. We are interested in their beliefs and practices. 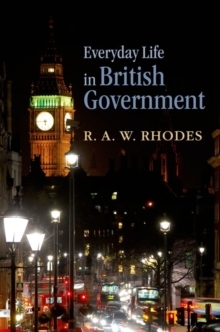 In his fascinating, new piece of political anthropology, Rod Rhodes uncovers exactly how the British political elite thinks and acts. Drawing on unprecedented access to ministers and senior civil servants in three government departments, he answers a simple question: 'what do they do?' On the basis of extensive fieldwork, supplemented by revealing interviews, he tries to capture the essence of their everyday life. He describes the ministers' and permanent secretaries' world through their owneyes, and explores how their beliefs and practices serve to create meaning in politics, policy making, and public-service delivery. He goes on to analyze how such beliefs and practices are embedded in traditions; in webs of protocols, rituals, and languages. The story he has to tell is dramatized through in-depth accounts of specific events to show ministers and civil servants 'in action'. He challenges the conventional constitutional, institutional, and managerial views of British governance. Instead, he describes a storytelling political-administrative elite, with beliefs and practices rooted in the Westminster model, which uses protocols and rituals to domesticate rude surprises and cope with recurrent dilemmas.